How Many Billions a Year Will the DSM-5 Cost? The information in this report relates to proposals for the World Health Organization’s forthcoming ICD-11, currently scheduled for pilot dissemination in 2015+; it does not apply to the existing ICD-10 or to the forthcoming US specific “clinical modification” of ICD-10, known as ICD-10-CM. 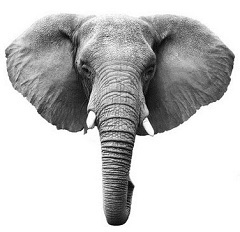 Caveat: The ICD-11 Beta drafting process is a work in progress over the next two to three years. The Beta draft is updated on a daily basis. Parent terms, category terms and sorting codes assigned to categories are subject to change as chapter reorganization progresses. Images and text in this posting may not reflect the most recently assigned categories and codes. This post reflects the Beta draft as it stood at July 25, 2012. Please also read the ICD-11 Beta Draft Caveats. Post #190 Changes to ICD-11 Beta drafting platform: Bodily Distress Disorders (1) reported on proposals for including three Bodily distress disorder categories in the Somatoform Disorders section of the ICD-11 Beta drafting platform which appear potentially to replace or subsume a number of existing ICD-10 Somatoform Disorder categories. That post has been revised to reflect clarifications from Professor, Sir David Goldberg, M.D., around the Primary care version of ICD-11 and to include additional material. The report in this post updates on current proposals for the ICD-11 Beta drafting platform for revision of the following ICD-10 categories: Neurasthenia, Postviral fatigue syndrome (PVFS), Benign myalgic encephalomyelitis (ME), Chronic fatigue syndrome (CFS), Fibromyalgia (FM) and Irritable bowel syndrome (IBS) for the full version of ICD-11. Increased access to content and interaction with the drafting process can be obtained by registering. Neurasthenia is not classified in DSM-IV and is not proposed to be classified in DSM-5. 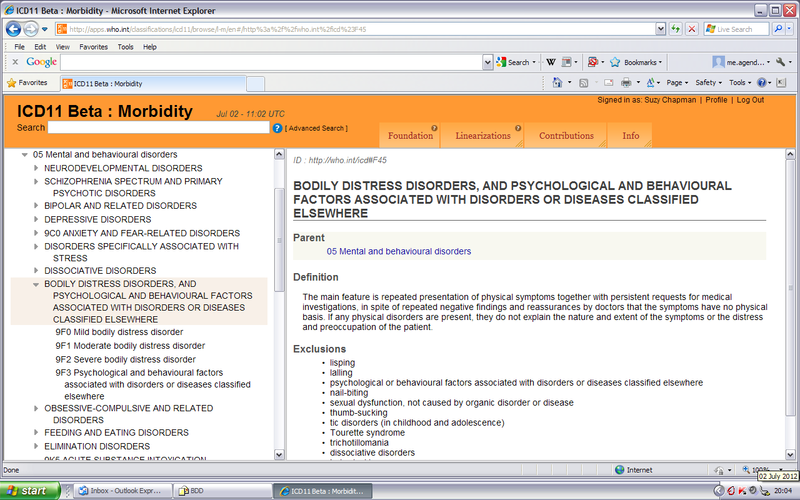 On July 4, all child categories classified under parent class, 9S1 Other neurotic disorders, including Neurasthenia and its Inclusion, Fatigue syndrome, were removed from both the FC and LM view and from the PDF for the Chapter 5 Print version and there is currently no listing for any of these categories and child categories under any parent. 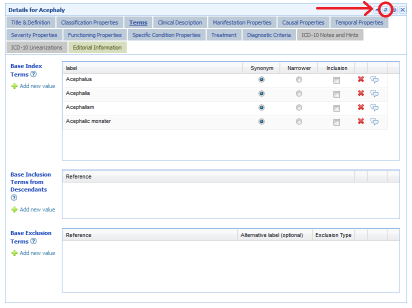 As no “Change history” records display in the public version of the Beta draft, it cannot be determined from what information is available whether these categories are temporarily omitted while this section of Chapter 5 is being reorganized, or whether all or selected of these ICD-10 categories are proposed to be retired for ICD-11 or are destined to be subsumed under the proposed Bodily distress disorders categories that ICD Revision has yet to define. Neurasthenia remains listed as an Exclusion to Chapter 5 Generalized anxiety disorder and Chapter 18 Malaise and fatigue but these Exclusions may be awaiting attention, if the intention is to retire a number of ICD-10 terms. I will update when it becomes apparent what the intention is for these currently missing categories. 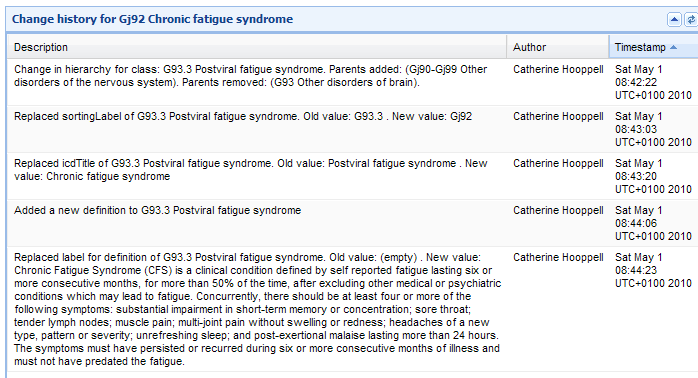 Benign myalgic encephalomyelitis is also coded in the Tabular List to G93.3 Postviral fatigue syndrome. Chronic fatigue syndrome is not classified within the Tabular List but is indexed to G93.3 in Volume 3: The Alphabetical Index. In indexing Chronic fatigue syndrome to G93.3, ICD-10 does not specify whether it views the term as a synonym, subclass or “best coding guess” to Title term, Postviral fatigue syndrome or to Benign myalgic encephalomyelitis. Nor does ICD-10 specify the relationship between Postviral fatigue syndrome and Benign myalgic encephalomyelitis. In June 2010, I reported that in May 2010, a change of hierarchy had been recorded in the ICD-11 iCAT Alpha drafting platform “Change History” and “Category Discussion Notes” for class: G93.3 Postviral fatigue syndrome. There are a number of terms listed under Synonyms to Title term Chronic fatigue syndrome including Benign myalgic encephalomyelitis and Postviral fatigue syndrome. 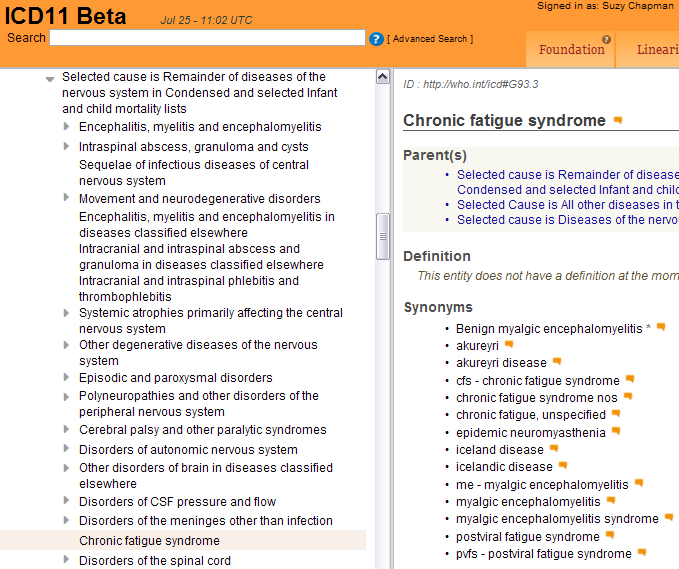 Also listed under “Synonyms” are “chronic fatigue syndrome nos” and “chronic fatigue, unspecified” (both imported from current proposals for locating Chronic fatigue syndrome in Chapter 18: Symptoms and Signs in the forthcoming US specific, ICD-10-CM). There is currently no discrete ICD Title term listed for Postviral fatigue syndrome in either the Foundation Component or Linearization Morbidity view and no discrete ICD Title term for Benign myalgic encephalomyelitis. I shall continue to monitor the Beta drafting process and update on any significant developments for both ICD-11 Chapter 5 and Chapter 6 and for ICD11-PHC for the categories that are the focus of this post and post #190. 3] Goldberg, D. Guest editorial. A revised mental health classification for use in general medical settings: the ICD11–PHC 1. International Psychiatry, Page 1, February 2011. 4] 21st Century Global Mental Health by Dr Eliot Sorel, Professor, George Washington University, Washington D.C.